Outdoor Kitchen Ideas: Al-Fresco Cooking for All! Building and designing an outdoor kitchen can be fun, but also a lot of work. It involves quite a bit of planning and one needs to make sure that the kitchen will work well for the space it will be built in. Because of this, planning an outdoor kitchen can be challenging sometimes. However, it doesn’t have to be so. This article looks at Outdoor Kitchen Ideas, and gives all the main points of consideration and contemplation involved in building and maintaining an outdoor kitchen. Besides being a nice place to enjoy a drink or meal outdoors, an outdoor kitchen can add a unique look to one’s landscaping. It can be designed according to one’s preferences so it can perfectly match and enhance the surrounding area. An outdoor kitchen can also be the perfect place for entertaining. It can be decorated for special occasions and be the ideal place to host a garden party. It can also keep strong cooking smells outdoors which is unlike indoor kitchens which can smell of strong cooking odors sometimes. Outdoor kitchens can also increase the value of a home. Many often look for this amenity when searching for a new house, which means it can boost the home’s value significantly. Before starting out with the outdoor kitchen adventure, there are a few things to keep in mind. There are a variety of styles commonly produced for outdoor kitchens. Naturally, you’ll probably do best to stick with pairing the design of your home with the design of your outdoor kitchen, but not always. Blending and mixing and matching can be visually stunning! Here are a few style ideas. Modern outdoor kitchens often feature simple lines and cool stainless steel. We love the way the outdoor pizza oven integrates into the granite counter! This outdoor kitchen feels so warm and inviting! The wood roof blended with the concrete and stucco walls create a pleasant environment, and the stainless steel cabinetry gives a professional finish. This lovely farmhouse-style kitchen features wood paneling blended with brick and stone. The pavilion-style roof makes the space lofty and inviting. Unless you have a background in the trades, it’s highly likely you’ll want a professional like those from CuisineBank to do your outdoor kitchen work. Of course, this depends on the complexity of the work, but running gas lines, electrical wiring, plumbing pipes and the like, as we well as setting up and designing the kitchen cabinetry and frame are all jobs typically done by professional builders and designers. That said, there are still many DIY options for those who don’t want to break the bank! Some pre-fab islands can be installed without pulling permits, but if you’re doing plumbing, wiring, and structural work, you’ll likely need to pull a building permit and get inspections. Any electrical outlets need to be rated for outdoor use, with GFCI breakers and proper housings. Can Outdoor Kitchens be put on a Deck? An outdoor kitchen can be installed on a deck, but it’s good to check the weight of everything. If it is to be installed on the top of a wooden platform, make sure there is enough support on the bottom to keep the contents on the top safe and secure. Ideally, if this is done, one needs to think small as too much stuff on a deck can make everything a bit crowded. Be sure you consider your appliances ahead of time, especially if you’re building an outdoor kitchen around a setup where the appliances will be built in. It’s very important to ensure that the refrigerator you purchase has the appropriate ventilation system for the kitchen island, and it’s important to ensure that the grill cut out will fit a grill that is right for your needs. We’ll go into further details on these issues below. That dorm-room fridge you have sitting in the attic collecting dust is not necessarily outdoor-rated and is likely not appropriate for outdoor use. Be sure you purchase the appropriate appliances for your environment, and for your safety! That counter space is important! Be sure to leave at least 18″ on each side of the grill, if you can. That way, you’ll have a spot to place the food you’ll be cooking. If necessary, pick up an outdoor utility cart to make the cooking task easier. When shopping for materials to use in the kitchen there are a few to consider. Most prefabricated islands are constructed using some sort of steel frame, with a stone, ffaux stone, tile, concrete, or other veneer material as a finish. These finishes are quite attractive and can provide an authentic, elegant style. They’re also robust and capable of withstanding the elements, as they are often used on exterior home construction. 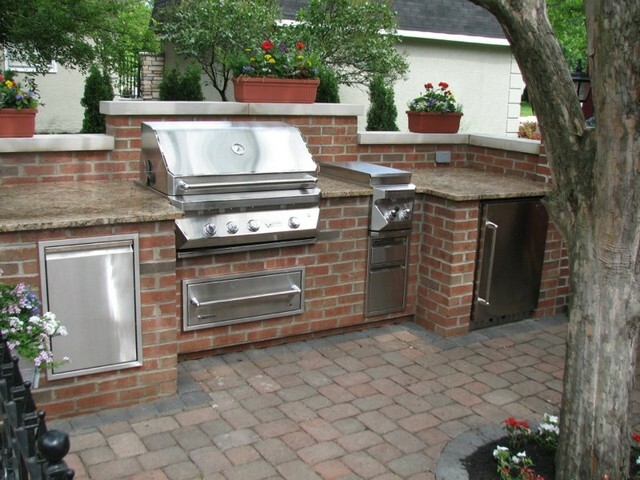 Brick is a great choice for outdoor kitchen materials. Brick is typically fairly inexpensive, and once you get the hang of it, you can even DIY a good deal of the work. Making sure you have a proper foundation for the weight of the brick is important, but once you have the foundation, you can pretty easily build a variety of shapes and sizes with brick. Stainless steel is commonly used as well for kitchen walls and countertops, and especially for drawers. Granite is one of the most popular to incorporate into an outdoor kitchen because it is sturdy and can be sealed. It can also be built with UV stabilizers to help prevent it from getting too hot when sitting under the sun for long periods of time. Stainless steel is also good to use on islands and countertops because it can be cleaned off easily and doesn’t rust. Wood can be an excellent material for an outdoor kitchen, though you need to ensure that the type of wood you choose can handle continuous exposure to the elements. Teak, cedar, pressure treated pine, and eucalyptus are all good choices for wooden outdoor kitchens. Yes, those granite counters that are in every kitchen in the world now are also perfect for outdoor kitchens. While granite needs to be sealed, it will last forever in an outdoor environment. For reference, see mountains. Tile can be an excellent solution for outdoor cabinetry and countertops. Tile can be quite inexpensive (though of course, it can be super pricey as well! ), and can be DIYed pretty easily. Concrete countertops and cabinets are extremely robust and are an excellent choice for outdoor kitchens, especially in modern environments. See our concrete furniture ideas for more inspiration. And we love the built-in fireplace in this image! Another material to consider is resin plastic, though not necessarily for islands or actual kitchen framework. Resin plastic often looks, well, plastic-y, but it doesn’t have to! Several manufacturers are doing great work with the material, making it look quite nice, and offering attractive, robust outdoor storage at an inexpensive price point. It can be a great solution for furniture and storage cabinetry. 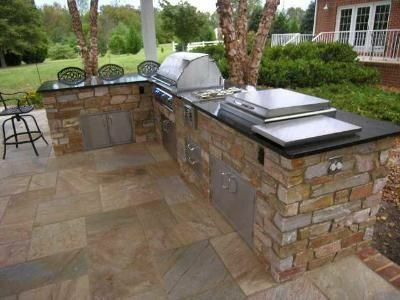 There are plenty of different materials one can use when putting their outdoor kitchen together. Instead of just using one, like stone, many can be mixed together in the design. This can add a distinctive and fun look to the outdoor kitchen rather than it being all uniform. It can also help provide a transition point from the materials chosen for the house, to the materials chosen for the outdoor kitchen. Are There Materials That Shouldn’t be Used Outdoors? Unfortunately, the materials used in indoor kitchens are unlikely to be useful in an outdoor kitchen, unless it is extremely well covered and protected from any wetness, moisture, excessive heat, etc. Unless you live in the perfect environment, with a large roof over the outdoor kitchen, if you choose to put in particle board Ikea cabinets, well they won’t last long! Another important thing to keep in mind when shopping for materials is that limestone isn’t always the best material to use. Limestone might look nice, but it’s very porous which can make it crumble easily. This can end up destroying the kitchen as things will sink in and not be held up well. While limestone can be used it isn’t always the best option, especially if installed in colder climates which could cause it to crack. 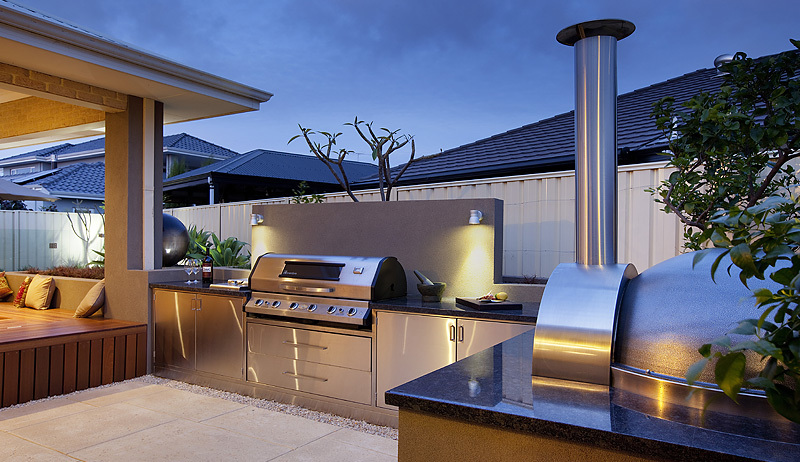 There are plenty of things one can do when designing an outdoor kitchen. Below are a few ideas that one can consider using in theirs. An island can be placed practically anywhere in the outdoor kitchen and can be the spot where any food and drinks are placed. Better yet, islands can be designed in various styles so they can be made to perfectly match the outdoor kitchen’s design scheme. Some come prefabricated all ready to go, while others come in just a frame which can be finished in a variety of ways. And of course, you could always have one custom built on site. The closer your outdoor kitchen is to your house, the cheaper it will be. There will be lower costs to running pipes, gas, electricity, etc. out to the kitchen when it is close to the main house. Additionally, if you can keep your keep your kitchen close to your indoor kitchen, you’ll make your life much easier! Naturally, you’ll have items in the indoor kitchen that you’ll want to get, so having the two close to each other will simplify the use of the outdoor kitchen. That said, grills should be positioned in such a way that there is little risk of fire. Keep grills away from wood siding, decks, and trees. Unless you have a circumstance where your outdoor kitchen will not get wet at all, you’ll likely need to use a material selection that is specifically for outdoor use. Typically drawers and cabinets are made of stainless steel, and each individual drawer can be quite pricey. Still, these drawers are quite useful, and they fully seal in a waterproof manner, ensuring that whatever you put inside the drawers won’t be ruined due to water infiltration. Most deck boxes are squat, bench-style units that are great for storing pool toys, towels, and the like. 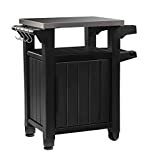 However, not all are, and some more upright deck boxes can go a long way toward making your outdoor kitchen a useful place, without breaking the bank! For example, this Suncast Vertical Deck Box would work extremely well in a kitchen, and with the added shelf, would make a great option for storing plates, cups, and similar cutlery and crockery. You get quite a bit of storage space for the price of a single Kitchen Stainless Steel Drawer. DECK STORAGE BOX: Beautiful plastic outdoor box for patio, deck, yard, porch, garage, and shed storage! VERSATILE: Features generous capacity for storing large patio cushions while taking up the same small footprint as a traditional deck box! Outdoor prep stations can make cooking and serving food a much more comfortable experience. If you don’t care for the whole built-in outdoor island setup, an Outdoor Prep Station combined with your existing grill could get you pretty far along to a functional outdoor kitchen. We love the Keter Unity XL prep station in particular, though there are many excellent options on the market today. Most people think of their cooler as a cheap insulated plastic box, great for taking to the beach, but not for leaving out as an attractive, functional object for the outdoor kitchen. And yes, most coolers are like this, but not all! 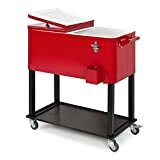 We looked at several attractive rolling patio coolers in this article, and many of them will definitely work well in any outdoor kitchen environment. When you’re cooking you want to be able to easily see all of your cooking areas, so a few runs of string lights are probably not going to do it! Two common ways to illuminate your space are ceiling lights if you have a roof, and wall lights. 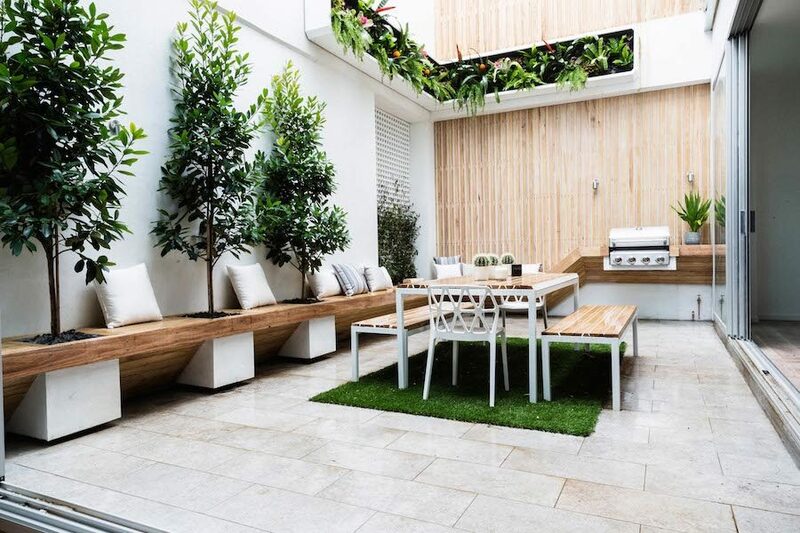 If you’re going to have a roof or pergola above the outdoor kitchen, you can use an outdoor pendant light or ceiling light to provide illumination. This design keeps the cooking area open but provides plenty of lighting. BUY WITH CONFIDENCE ：All LNC hanging lights are UL Listed For indoor dry Location LNC offers 2-years satisfaction . CONVIENT INSTALLATION - This black cage metal hanging lights can fit in most areas with its max height of 60". 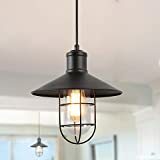 By using adjustable hanging cord, vintage cage pendant light matches your space whether it is transitional, industrial, modern or farmhouse style! It is to fill your space with lights and joy! WIDE APPLICATION. Perfect for kitchen island, bedside reading, Headboard, bedroom, bathroom, dining room, living room, corridor, staircase, office, loft, cafe, craft room, bar, restaurant, club and more. PERFECT DIMENSION FOR VARIOUS CEILINGS: Round Canopy: 5. 1" in dia. /Light Fixture: 10. 2" L dia x 10. 2" H, Ceiling to Bottom Fixture Heights: vary from 10" up to 59". This pendant lights is designed to work on most ceilings including flat, sloped, slanted and vaulted ceilings. BULBS COMPATIBLE - This pendant light is perfect for use with E26 base vintage bulbs ( NOT included ) to create the best ambient and task lighting effect. If you’re not going to have a roof over your head, then you’ll need to use some sort of wall lighting. Of course, if you don’t have any walls around, this can be difficult! The best thing to do in these situations is to build a backsplash behind the outdoor kitchen, a space that will enable you to install some outdoor wall lights above the cooking surfaces. 13" high x 7 1/4" wide. Extends 6" from the wall. Glass is 10" high x 4" wide. Backplate is 6" high x 4 1/2" wide. Weighs 2.73 lbs. Built-in 13 watt LED module. Not dimmable. 3000K color temperature. 80 CRI. Light output is 1150 lumens, comparable to a 75 watt incandescent bulb. 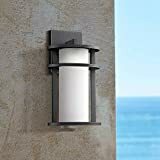 Aline energy-efficient LED outdoor wall light from John Timberland. Black finish steel. Steel construction. White frosted glass. If you don’t want either a roof or walls around your outdoor kitchen, you could use some floodlights or spotlights from your house, and aim them at the kitchen area. These lights tend to be super bright and on the harsh side, so they’re definitely not recommended unless you have no other choice. SUPER BRIGHT, EFFORTLESS SECURITY - Hyperikon waterproof LED security flood lights are incredibly bright at 90 lumens/watt, deterring any unwanted activity. Add a level of security with built-in motion and dusk-to-dawn sensors. The security lights will turn on when sensing ambient light levels or motion in a range of 30-40 feet. 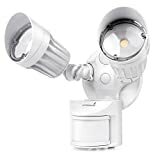 QUICK AND SIMPLE INSTALLATION - This corded LED outdoor security light can easily be installed by mounting to a wall and following a few simple wiring steps. Simply choose your preferred location at your home or business to illuminate garages, workshops, yards, storage rooms, driveways, parking lots, and more! RELIABLE IN ANY WEATHER - The IP65 weatherproof rating ensures that your LED motion security light can stand up to the elements. Rain, sleet, or snow, you can rely on the Hyperikon security light fixture to provide super bright light! 1,000+ HONEST REVIEWS - Hyperikon works hard to ensure our customers are completely satisfied with their purchases. Our authentic product reviews are an honest reflection of real customers (including lighting professionals) and how our security lights improved their evening routines and sense of safety. UNLIMITED 5-YEAR WARRANTY - All Hyperikon LED products are covered under our industry-leading 5-year warranty. Contact our customer service team 24/7 with any issues. We've got you covered! Of course, the primary focus of the outdoor kitchen is the grill! If you don’t want to break the bank, you can keep your grill separate from the outdoor kitchen as a stand-alone unit, but nothing beats the built-in look for style and functionality. Just be sure to confirm that your grill will fit in the space provided in your island. The sizes are largely standardized at this point, but it’s more of a wild west than, say, indoor kitchen cooktops are. If you’re going to go through all of the difficulty and expense of building an outdoor kitchen with permanent built-in cabinets and the like, running a natural gas line is a no-brainer. It’s so much easier than working with propane! However, if you’re not going all out, and doing more of a DIY setup, then sticking with propane is probably the wisest solution and the cheapest! 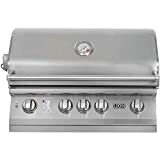 While the grill will always be the start of the outdoor kitchen show, the griddle can be a helpful, and fun, accessory! If you’re cooking for a lot of people, having a griddle and a grill working together can save a lot of time! If you’re putting in an outdoor refrigerator, you need to consider the space and environment where it will be installed. If it’s going to be installed in a cabinet, under a countertop, you need to ensure that the ventilation system is compatible with your design. 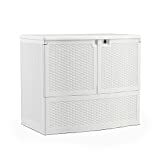 There are three major ventilation designs for outdoor refrigerators, with varying costs associated. Front venting outdoor refrigerators are typically the most expensive. They are designed to vent out the front and are typically built into a wall of cabinetry or an island, in a similar fashion to most dishwashers. Rear venting refrigerators vent out the back and need a few inches of clearance to expel heat. If you have an island cabinet with a void behind the refrigerator pocket, you can use a rear-venting fridge. Or if you have a wall panel behind it, you could conceivably cut a hole in it or otherwise perforate it to enable the refrigerator to vent out the back. These refrigerators vent from the bottom and are often on wheels. They usually aren’t built-in, but rather sit at the end of a run of cabinets, or at the end of the island. They are typically taller than counter-height, and won’t fit under a countertop. They need some space underneath to allow air to circulate. 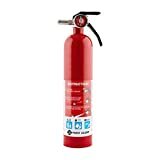 There’s no reason an outdoor kitchen would be more prone to fires than an indoor kitchen, but it’s still wise to have a fire extinguisher handy if you’re frequently cooking with fire. When thinking about outdoor kitchens, the first stop is the grill, but that isn’t where the journey should end! 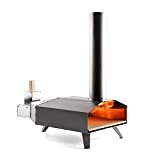 An outdoor pizza oven can be an excellent addition to the kitchen, and since these ovens are capable of getting up to the high temperatures necessary to make a good pizza, they will allow the outdoor chef to shine on pizza night! Friendly: runs on energy-efficient, sustainably sourced wood pellets. One way to add a cool touch to the outdoor kitchen is by installing a fire pit in the area, or even by using a fire pit table. 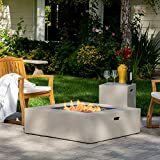 The fire table can provide warmth and ambiance, and even function as a cooking device in some cases. If a fire pit just doesn’t do it for you, perhaps for safety or pet reasons, consider an outdoor heater. We love the look of the pyramid-style heaters, but they don’t really work quite as well as the traditional propane heaters do. And if you’re running a dedicated gas line for your grill, consider running a stub for your heater while you’re at it, and you can get a natural gas patio heater and not need to screw around with propane tanks! The winterization steps for your outdoor kitchen depend significantly on your individual climate, and the specific set of appliances and utilities you’re working with. In general, you want to cover up your outdoor kitchen island, or at least the appliances if at all possible. You may need to get a custom cover to enable you to accomplish this, but it’s possible that a large off the shelf cover will fit over your island, depending on the size needs. 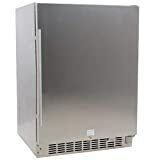 Disconnect your outdoor fridge, and ideally, bring it in the garage or store it in the shed or another sheltered spot. As with any outdoor water lines, these will need to be drained and ideally gravity-winterized. All water needs to be removed from the lines, and blown out if necessary, in order to prevent freezing and bursting during the winter. Designing an outdoor kitchen requires some work, but it’s worth it. Not only will it add a beautiful look to an outdoor landscape, but it can be a great place to entertain and enjoy a meal. We hope we have supplied you with some information and inspiration to enable you to get started on your own outdoor kitchen, whether it’s a full custom super-high-end kitchen, or a few simple cabinets and a grill. Both can be magical if done right!